What's the antidote to the pace and pressure of modern-day life? The doctor knows. He's Dr. John J. Buchino, and his prescription is — porching. 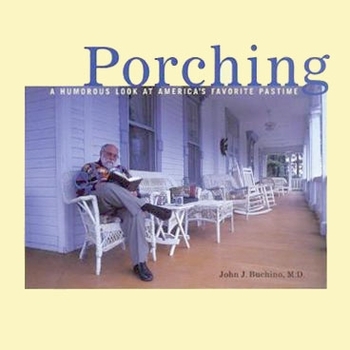 In this light-hearted look at what must be the most prevalent activity in America, Dr. John extols the virtues of the porching life, from its physiological and psychological benefits to its role in child-rearing, community relations, crime prevention and economic development. With tongue firmly in cheek, he gives us porching songs, famous porchers in history and famous porching quotations. It's enough to make you get up, go outside, and fall fast asleep on the porch. Another Buchino, Dr. Joseph J. Buchino, has contributed wonderful color photographs of porches across America, and artist Kathy Finnegan provides sketches of scenes from life on the edge of the house. John J. Buchino, M.D., is the chief of pathology for Kosair Children's Hospital, and is Professor of Pediatrics and Pathology at the University of Louisville School of Medicine.